Supporters of a border wall with Mexico attended a rally held by President Trump in El Paso Monday. EL PASO, Texas — President Trump charged ahead Monday with his pledge to build a wall at the US-Mexico border, skimming over the details of lawmakers’ tentative deal that would give him far less than he’s been demanding and declaring he’s ‘‘setting the stage’’ to deliver on his signature campaign promise. In the first dueling rallies of the 2020 campaign season, Trump’s ‘‘Finish the Wall’’ rally in El Paso went head-to-head against one by Beto O’Rourke, a former Democratic congressman and potential Trump rival in 2020, who argued that walls cause more problems than they solve. The rallies across the street from each other served as a preview of the potentially heated yearslong fight over the direction of the country. And they made clear that Trump’s long-promised border wall is sure to play an outsized role in the presidential race, as both sides use it to try to rally their supporters and highlight their contrasting approaches. Standing in a packed stadium under a giant American flag and banners saying ‘‘FINISH THE WALL,’’ Trump insisted that large portions of the project were already under construction and vowed to fulfill his 2016 campaign promise regardless of what happens in Congress. O’Rourke, meanwhile, held a march with dozens of local civic, human rights, and Hispanic groups in his hometown, followed by a protest rally attended by thousands on a baseball field within shouting distance from the arena where Trump spoke. 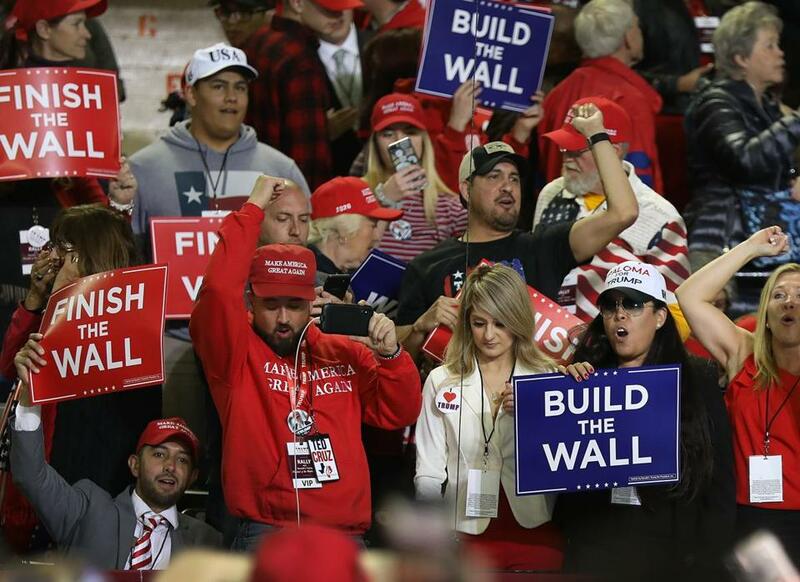 More than a half-hour in his rally, Trump had scarcely mentioned immigration, offering just a passing suggestion that those chanting ‘‘Build the Wall’’ switch to ‘‘Finish the Wall.’’ Instead, he mocked O’Rourke, insisting the Texan has ‘‘very little going for himself except he’s got a great first name’’ and deriding his crowd size, even though both men drew thousands. The rallies began moments after negotiators on Capitol Hill announced that lawmakers had reached an agreement in principle to fund the government ahead of a midnight Friday deadline to avoid another partial government shutdown. Republicans tentatively agreed to far less money for Trump’s border wall than the White House’s $5.7 billion wish list, settling for a figure of nearly $1.4 billion, according to congressional aides. The funding measure would be through the fiscal year, which ends Sept. 30. But the president appeared oblivious to the deal, saying that he’d been informed by aides that negotiators had made some progress but that he had declined to be fully briefed because he wanted to go on stage. Trump has insisted that large portions of the wall are already underway. But the work focuses almost entirely on replacing existing barriers. Work on the first extension — 14 miles in Texas’s Rio Grande Valley — starts this month. The other 83 miles that his administration has awarded contracts for are replacement projects. Trump has repeatedly pointed to El Paso to make his case that a border wall is necessary, asserting that barriers turned the city from one of the nation’s most dangerous to one of its safest. Yet, El Paso had a murder rate of less than half the national average in 2005, a year before the most recent expansion of its border fence. That’s despite being just across the border from Ciudad Juarez, Mexico, a city plagued by drug violence. Many in the city have bristled at the prospect of becoming a border wall poster child.